TIJA apartments are luxury, spacious and well-equipped fats for a permanent or temporary residence. Our ofer is great for business people as well for individual customers. TIJA apartments can be treated as an alternatve for a hotel rooms – a high quality with atractve prices. 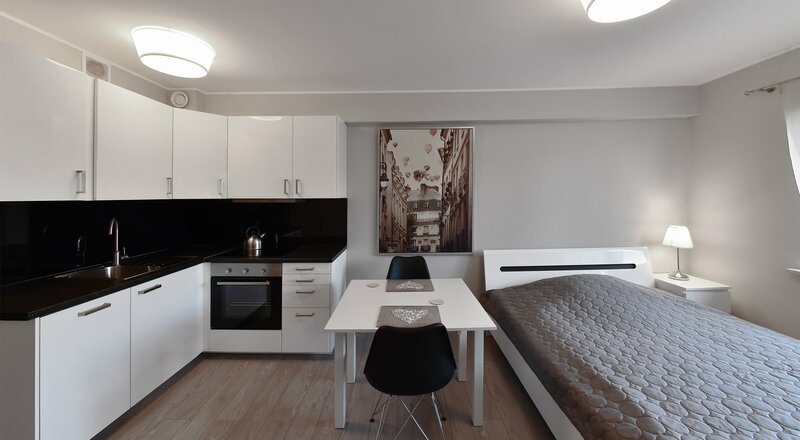 During the residence our customers have a service apartment at their disposal. The crew is always ready for help and advice. Luxury and air-conditoned interiors and broadband internet access create the right conditons to work and relax. TIJA apartments are located in central Września. Our customers have a huge number of opportunites such as gym, wellness spa with steam bath and spacious garden. Furthermore, there is an electronically monitored and free parking. A great locaton ensures an easy access to diferent atractons in the city. Luxury fats, lots of amenites and high quality with good prices create some good memories. All of apartments are situated in one building at 30 Kaliska Street in Września. How long can I rent the fat? We offer a short-time rent (30 days below) and also a long-time rent (over 30 days). What’s about equipment of fats? Every of our fat consists of living room with the kitchenete, bedroom and bathroom. The apartments are well-equipped (electronics for instance television, fridge, dishwasher, oven). What’s about an internet access in fats? Every apartment has an internet access and cable television. What’s about an air conditioning? Every apartment is equipped with an air conditoning. Where is a car park? Our customers can leave their cars on a car park in front of the building. Is a reception in building? Yes, the reception is open 8 a.m. – 4 p.m.
A whole building is fully monitored and secured by intercom at the entrance. At what time does a twenty four period begins and ends? A twenty four period begins at 3 p.m. and ends at 12 p.m. We can also ofer an individual change of tmetable on customer’s wish. On which attractions can I count? Despite of fully equipment of fats we can also ofer our customers an access to the gym and wellness spa. During the summer period the garden is at customer’s disposal. – to fll out the form (available on our website – booking/reservation). What’s about the forms of payment? Our customers can pay in cash or do a transfer. Yes, of course. It’s possible to get an invoice. How can I receive the keys? The keys are available in our reception at Kaliska Street.